The specialized and in-depth knowledge subject matter experts have is a treasure trove for their organization. If leveraged with a learning initiative and transferred properly, it can significantly boost overall performance within that organization. However, instructional designers face a major problem. SMEs have high-priority, full-time jobs — and not much time to spare. Furthermore, the time and effort required for collaborating on the instructional learning course/material may be considered as additional work. Given that high quality content/courseware demands a lot of time, input, and dedication from SMEs, DEVELOPING quality content on time and within budget is problematic and challenging. This post highlights an actionable roadmap for engaging SMEs and collecting their require information so that eLearning projects can be completed within time and in budget. Willingness to engage in discussion with you and clarify concepts where the needs arises, and even respond to follow ups. Therefore, you have to establish the expectations clearly and in detail up front. You have to communicate why sharing their information is beneficial, how they can do it, and how you will be supporting them by minimizing their workload. eLearninig projects flow effortlessly when everyone involved knows what is expected from them and what are their roles and responsibilities. Understand your SME like you would a client. Profile their expertise, the types or form of communication that they have been involved in recently (presentation, hands-on seminars, written materials, or combined). Find out the areas that they enjoy the most, the topics that they are most enthusiastic about, the type of interaction (one-on-one, one-all, or discussion) they like etc. Are they better at communicating their experience, such as personal experiences and war stories? Do they talk about more systematic ideas like bulleted best practices for getting the work done faster and better? Once you have this information, plan your interaction. Set a meeting plan, for example if an SME is involved in dealing with advertising and is more enthusiastic about visual aspects of the ads, then plan on talking about the videos first and then introducing other aspects into the discussion as questions. Tell them beforehand how much time you exactly need from them. Nobody would want to drone on for 40 minutes on a subject matter that they are not very enthusiastic about but which they have come to know well over the years. Starting with a kick-off meeting to share perspective: Dedicate the initial “information gathering” meeting to selling your project. Discuss the basic project parameters (like an outline, target audience, etc.) and tell them how the final content can reduce stress from their work (e.g. the final presentation, whitepaper, or guide will take work off them when training sessions is concerned). Ask them for input and show them that you are committed to making it work by taking in their real-time feedback to make changes to your outline. Review the key steps you can take before and during, the interview to maximize its effectiveness. Tell them how you hope to support them. For example, if they need to provide information, tell them the areas where you can work. Inform them that they are need for offering specialized information such as war stories and tips and tricks etc. Get a verbal commitment: This is crucial, and it can significantly increase chances of your success. If possible, agree to a written working agreement (a tentative project outline and timeline signed by both parties). If they are better at communicating their ideas verbally, schedule interviews over the phone e.g. while they are commuting. If they are good with giving your diagrams of a concept and linking them let them know. Be flexible — Flexibility of schedules and processes to accommodate very busy people. Inform them before hand — Be realistic. Tell them up front the time needed for the meeting to discuss all topics. Ask them how much they can and work accordingly. Come Prepared —Know what you want from the meeting. Set important questions and estimated time for each. And above all research the topic the SME will be talking about. Simplify Tasks — Employ the right tools, processes, and techniques. Remind them of the value of their input — both time and knowledge. A simple thank you and reminder that you understand the trouble they have taken to contribute goes a long way in establishing a more humane relation. It ensures ownership of the project. Involve them— Make them part of the decision process. Seek advice in areas where they have expertise, but avoid asking irrelevant questions. Ask for recommendations and incorporating their feedback and ideas as best as possible. 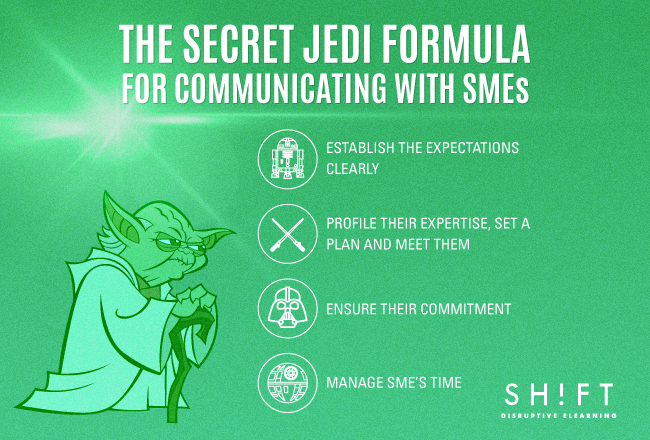 Over Communicate — Maintain regular, verbal, and proactive communication with SMEs. Keep your meetings scheduled in advance, and keep them short. Share feedback as to what’s working and what isn’t.